Election exit polls show Merkel on course for a fourth term. 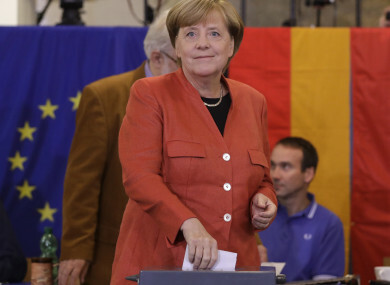 German Chancellor Angela Merkel casts her vote in Berlin. CHANCELLOR ANGELA MERKEL has clinched a fourth term in Germany’s general election, but her victory was clouded by the hard-right AfD party winning its first seats in parliament. Merkel, who after 12 years in power held a double-digit lead for most of the campaign, scored around 33% of the vote with her conservative Christian Union (CDU/CSU) bloc, according to exit polls. Its nearest rivals, the Social Democrats and their candidate Martin Schulz, came in a distant second, with about 20-21%. But in a bombshell for the German establishment, the anti-Islam, anti-immigration Alternative for Germany (AfD) captured around 13%, making it the country’s third biggest political force. The four-year-old party with links to the far-right French National Front and Britain’s UKIP has been shunned by Germany’s mainstream. Alarmed by the prospect of what Foreign Minister Sigmar Gabriel branded “real Nazis” entering the Bundestag for the first time since World War II, the candidates had used their final days of campaigning to implore voters to reject the populists. “This Alternative for Germany is no alternative. They are a shame for our nation,” former European Parliament chief Schulz told a rally in Berlin on Friday. Another three parties cleared the 5% hurdle to representations: the liberal FDP (10%), anti-capitalist Die Linke and ecologist Greens (both 9%). Merkel, 63, whose campaign events were regularly disrupted by jeering AfD supporters, said in her final stump speech in the southern city of Munich that “the future of Germany will definitely not be built with whistles and hollers”. Merkel, often called the most powerful woman on the global stage, ran on her record as a steady pair of hands in a turbulent world, warning voters not to indulge in “experiments”. While the likelihood of the AfD winning seats was clear for months, commentators called its strong showing a “watershed moment” in German post-war politics. Law student Sabine Maier dismissed the AfD as “too extreme” as she voted in Berlin. “They aren’t all fascists,” she said. The SPD also found it hard to shine after four years as the junior partner in Merkel’s left-right “grand coalition”, marked by broad agreement on major issues, from foreign policy to migration. In the final stretch, the more outspoken Schulz told voters to reject Merkel’s “sleeping-pill politics” and vote against “another four years of stagnation and lethargy”. The CDU and the SPD have signalled they aren’t keen to continue their loveless marriage. The SPD’s catastrophic result may convince many rank-and-file members that the traditional working-class party would benefit from a stint in opposition to rekindle its fighting spirit. This would leave Merkel in need of new coalition partners — possibly the pro-business Free Democrats, who staged a comeback after crashing out of parliament four years ago. Email “Angela Merkel will lead Germany once more but the far-right delivers strong third place”. Feedback on “Angela Merkel will lead Germany once more but the far-right delivers strong third place”.